Supporting almost all video and audio formats including AVI, MPEG, WMV, 3GP, WMA, WAV, RA, M4A etc., Xilisoft BlackBerry Ringtone Maker provides a fast and easy-to-handle way for you to create BlackBerry ringtone from any video/audio in your multimedia collection. Not only a BlackBerry ringtone generator, Xilisoft BlackBerry Ringtone Maker is also a ringtone transfer to transfer the converted MP3 file to your BlackBerry memory card automatically when the conversion is finished as you like. Furthermore, this BlackBerry Ringtone converter helps you cut wanted part from a video/audio file and convert it to MP3 file as a ringtone for your BlackBerry. Pre-listen to the ringtone, then make your own BlackBerry ringtone with Xilisoft BlackBerry Ringtone Maker in just one click. With Xilisoft BlackBerry Ringtone Maker, you can make BlackBerry ringtones by converting almost all audios like WMA, WAV, M4A, etc. to MP3 files. Not only can it convert audio to ringtone, this BlackBerry ringtone generator can also extract the lovely background music from any video (AVI, MPEG, WMV, DivX, MP4, H.264/AVC, AVCHD, MKV, RM, MOV, XviD, 3GP, etc.) and convert it to MP3 as BlackBerry ringtone. 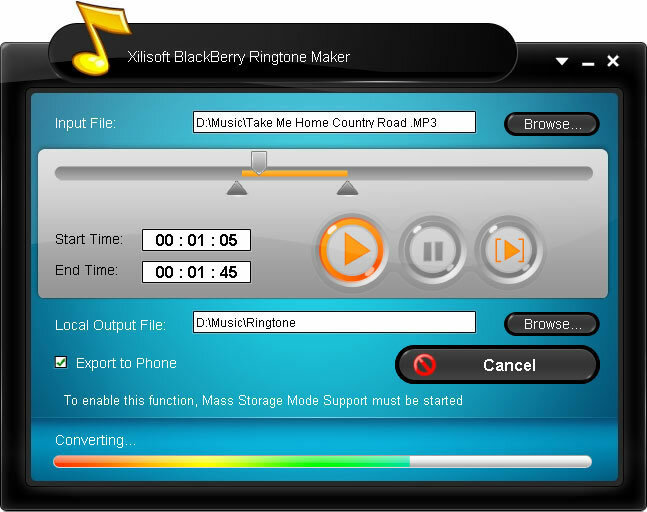 As a ringtone transfer, Xilisoft BlackBerry Ringtone Maker can transfer the converted MP3 file to BlackBerry directly when the conversion is finished. Just want a part of the music as your own ringtone? The smart BlackBerry ringtone maker can help you trim the part you want by setting the start and end time, and convert it to MP3 ringtone. To ensure the music to be converted is the one you want, you can pre-listen to the music with the built-in player before making. With the user-friendly interface, you will find that creating BlackBerry ringtone is so simple: just add a file and convert it to MP3! 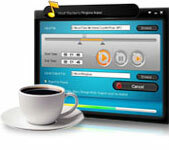 For different mother-tongue users, Xilisoft BlackBerry Ringtone Maker provides multiple interface languages: English, German, Japanese and Chinese.